Allways Shipping is an independently Australian owned company head quartered in the port of Fremantle, Western Australia. The business was established in 1999. The people at Allways have the required knowledge, qualifications and experience to offer innovative logistics solutions. We operate as ships agents, brokers, consultants and advisers. Our aim is to offer a uniquely personal approach to servicing and supporting our clients. We are accustomed to working with a wide range of owners, operators, EPCM’s, forwarders as well as leading mining and oil companies. 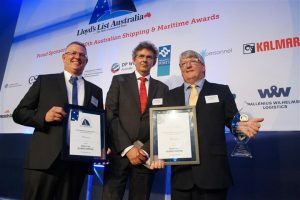 We are very proud to have been recognised at the 20th Annual Australian Shipping and Maritime Industry Awards 2015 having been awarded the Australian Maritime Safety Authority Seafarers Welfare Award for support provided to seafarers.